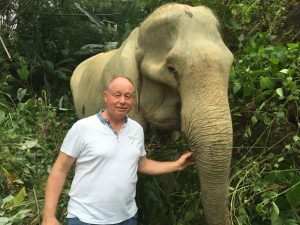 Southern Thailand Elephant Foundation (STEF) is delighted to announce the appointment as the charity’s Technical Advisor, of Lee Sambrook, one of the world’s leading elephant authorities. Zoo, he moved to Western Australia as Head Elephant Trainer at Perth Zoo, where he spent five years before returning to the UK as Team leader of Elephants at Whipsnade Zoo, where he had 11 Asian elephants under his care. He is particularly proud that ten elephant calves were born during his 21 years at ZSL. He is or has been a consultant for several zoos around the world. Chairman of Trustees, Dr Andrew Higgins, said: “I have been fortunate to know Lee for several years and I am delighted that the Trustees have decided to appoint him as Technical Adviser. Lee’s advice, guidance and a lifetime’s experience will ensure all of our projects are undertaken with the best interests of the elephant in mind”. 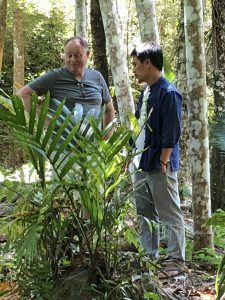 Already Lee has spent several weeks at the new Ban Ton Sae site (pictured here with Jakrapob Thaotad, STEF Trustee and Project Manager) working hard to ensure the ground is cleared and prepared for the housing of elephants that are in need of care and retirement.